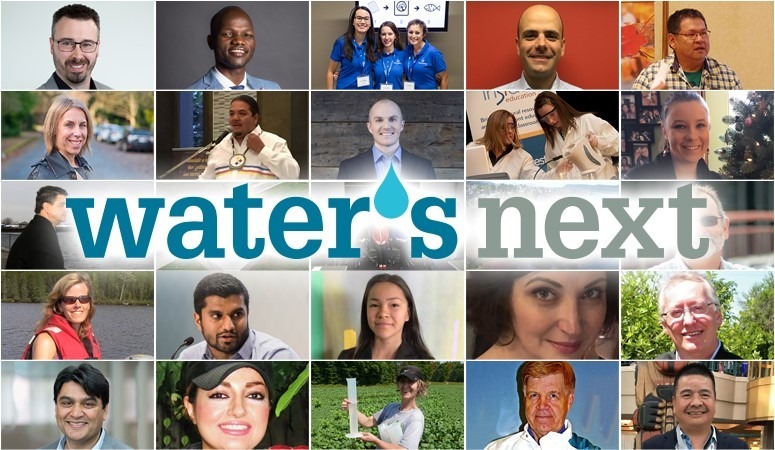 2018 Water’s Next Finalists Announced! Every year, Water Canada’s Water’s Next awards program honours the incredible achievements and ideas of individuals and companies that successfully work to make a positive change to water in our country and abroad. This year we received 59 nominations. Drawing on the advice of the esteemed group of water experts who make up the Water’s Next Selection Committee, we have narrowed the list to 34 finalists. Water Canada will announce the winners of the 2018 awards in Vancouver at the Water’s Next Awards Gala on June 20th at the Vancouver Marriott Pinnacle hotel as part of the 9th annual Canadian Water Summit. Water Canada will also share the winner’s stories in the July/August issue of the magazine. We invite you to join us in celebrating their spectacular accomplishments on June 20th in Vancouver! Rebecca Bingeman, Innovation, Science, and Economic Development Canada (ISED): working to ensure that Canadian water technology companies and sector organizations are represented in the marketplace, Bingeman assists entrepreneurs in navigating the complex and rapidly changing landscape of federal government initiatives. Gordon Bluesky, Brokenhead Ojibway Nation (BON): providing integral leadership to the Lake Winnipeg Indigenous Collective (LWIC), Bluesky is helping a group of First Nations that are seeking to address the lack of Indigenous representation in determining the ultimate health of Lake Winnipeg. The U.S. Consulate General Toronto: demonstrating innovation in their use of public-private partnerships, the U.S. Consulate General in Toronto has been convening groups to address critical issues in the Great Lakes to advance bilateral cooperation in the region. Trevor Andrew, Séwllkwe: Drawing on his knowledge as a water operator, Andrew has accomplished over 20 million litres of water saved in one year by repairing and inspecting homes for water leaks in the community and through data analysis and predictive operations. Andrew has achieved these savings through the development of the Séwllkwe TRACKING SOLUTIONS app. The app was implemented in three First Nations communities in 2015. Lynda Margaret Smithard, P.Eng: successfully expanding global knowledge on water treatment to remove dissolved antimony, chromium, and copper at a bench scale, Lynda and her engineering team have successfully designed a chemical precipitation program not typically considered a viable mining water treatment method. Lynn Mueller, SHARC International Systems. : as the founder, president, and CEO of Vancouver-based SHARC International Systems, Mueller has developed two innovative wastewater heat exchange technologies to take advantage of the ultimate renewable energy source—wastewater. Grant Sparling, Cowbell Brew: after attending a BrewLab in Sunderland, U.K., Sparling set out to build the world’s finest and most environmentally friendly brewhouse, operating on a closed-loop system with no impact on the municipal wastewater system. George W. Thorpe, BI Pure Water: Drawing on his industry knowledge as co-owner of BI Pure Water, Thorpe works hands-on with scientists, professors, and students of the RES’EAU board on the development of various innovative technology solutions and equipment for small systems water treatment. sectors, Giib has helped food processors achieve water savings of between 30–70 per cent; farms achieve 30–50 per cent water savings; and has inspired many spin-off projects. Pauline Gerrard, International Institute for Sustainable Development (IISD): channeling her passion for education and outreach, Gerard founded the IISD’s freshwater education program, inviting young people, community members, and First Nations to the IISD Experimental Lakes Area to spend time interacting with real world-class scientists. Jim Brown, Lytton First Nation: with more than two decades’ experience as a former band council administrator and as a level II water operator/former Lead Operator for Lytton First Nation in British Columbia, Brown founded a partnership that provides leadership and support to First Nations water operators, while advocating for better training, pay, and infrastructure investment. Kathryn Wagner, Inside Education: providing innovation-focused water education and literacy for students and teachers in K-12 schools, the program provides teachers with meaningful learning experiences related to water, notably making important connections in the water-energy-food nexus. Robert Haller, Canadian Water and Wastewater Association: improving water literacy, policy, collaboration, budget spending, and innovation across Canada, Haller has been a tireless advocate of the municipal water sector. As an advisor to governments across Canada, Haller has bridged relationships with regulators, industry, academia, and entrepreneurs, through advocacy, event development, and research. Dr. Karen Kidd, McMaster University: for her research to help us understand the effects of food production, natural resource extraction, urban environments on the health of freshwater, and marine ecosystems. Dr. Stefan Kienzle, University of Lethbridge: who is improving decision-making about water and land management at the watershed and provincial scales, to ensure water security, resilience in adaptation to climate change. Dr. Rehan Sadiq, University of British Columbia: who provides innovative and influential research, transforming the way small to medium-sized communities are managing their water supplies. Maryam Razi, University of Alberta: developing a novel nano-tensiometer, which can detect the adsorption of surfactants using electrical signals in SAGD operations. John Bergese, David Nairne + Associates Ltd.: implementing a collaborative approach between the community members and stakeholders to successfully end a long-term boil water advisory for the community of Nickeyeah IR25 in Lytton First Nation; integrating the RES’EAU Community Circle approach in other capital infrastructure projects with First Nations. James Thuch Madhier, founder, Rainmaker Enterprise: addressing intractable intercommunal conflicts over limited water sources, extreme hunger, poverty, youth, and women unemployment in remote parts of Africa, starting in South Sudan by implementing solar-powered water infrastructure. Autumn Peltier, Wikwemikong First Nation: an advocate for the protection of water and the environment since she was eight years old. Peltier is especially concerned with the lack of access to clean drinking water on First Nations reserves. Ellen Stitt, Ontario Clean Water Agency: a water operator who dedicates her free time to water literacy through OneWater Education workshops and the idontflush campaign. Thouheed Abdul Gaffoor and Mohamad Vedut, EMAGIN: supporting operators in the control room by harnessing an understanding of the built water cycle from an engineering perspective and through the use of machine learning. AquaHacking Challenge: a program to engage multi-disciplinary teams of hackers, engineers, water scientists, and environmentally-conscious young adults from various university campuses, research centers, and organizations. AquaHacking brings them together to collaborate on developing cleantech engineering, web, and mobile solutions to water issues affecting the Great Lakes and St. Lawrence Basin. FREDsense Technologies Corp., the FRED (the Field Ready Electrochemical Detector): a technology built using genetically modified bacteria that are programmed to sense chemicals found in water and report them electrochemically. Lauren Smith/ PolyGone Technologies: providing a filter technology installed by washing machine manufacturers and food and beverage producers to capture microfibres both at the site of release and at the site of contamination into food and beverage. LuminUltra: provides a proprietary method to measure microorganisms in water and intelligent decision support tools through a cloud software program. VTScada by Trihedral: delivering functional and intuitive HMI/SCADA software technology that allows water utilities and water integrators to efficiently build customized applications that can scale in size over the course of decades. ClinnUp Technologies Inc.: applying the EBR Technology at the City of L’Assomption, Quebec’s wastewater treatment plant, this demonstration project is scaling up a new electro-technology to address nutrient and heavy metal treatment and to reduce energy and sludge for an existing plant. Ladysmith WWTP, WSP: Extensive planning by multi-disciplinary design team went into the Ladysmith phase 3 Wastewater treatment upgrade. It is the first time a Moving Bed Biofilm Reactor (MBBR) combined with Dissolved Air Flotation (DAF) for solids separation has been used in western Canada. Livestock Water Recycling System: addressing issues of nutrient pollution from livestock operations, the LWR system provides a cost-effective solution for livestock producers to effectively manage manure nutrients to prevent the harmful effects of nutrient runoff and groundwater contamination. The result is reduced transport & handling costs, valuable fertilizers, eliminated risk of nutrient runoff or groundwater contamination, GHG reduction, and a reusable water source. Ostara’s Pearl process: first piloted at Metro Vancouver at Lulu Island in 2005, Ostara’s Pearl process for nutrient recovery and re-use now has commercial nutrient recovery facilities in Edmonton (EPCOR) and Saskatoon (City of Saskatoon), and one is currently in development in Winnipeg. In Edmonton, the company installed the first Pearl 10K in Canada, with target production capacity of 2,500 tons of high-value Crystal Green fertilizer every year. SHARC International Systems Inc: capturing energy from the heat that is normally wasted, SHARC’s two heat recovery products (SHARC and PIRANHA) are used to recover the heat energy from hot water and wastewater heat buildings and cool buildings, and heat the domestic hot water supply. VTScada by Trihedral: VTScada was designed to remove frustration at every stage of the SCADA/HMI software life cycle, from pricing and licensing, to development and support. VTScada’s allows wastewater operators to create advanced monitoring and control systems that are functional, intuitive and integrated across the utility. *Due to a tie, 6 finalists have been selected for the wastewater category. Filterra Bioretention System, Imbrium: a technology that offers a cost-effective, attractive stormwater treatment system featuring easy installation and simple maintenance. VTScada by Trihedral: a functional and intuitive HMI/SCADA software technology that allows water utilities and water integrators to efficiently build customized applications that can scale in size over the course of decades. Black Creek Sanitary Drainage Area Servicing Project, WSP: a project to accommodate flows for projected growth in areas of intensification up to 2041, reducing surcharge levels in trunk sewers during wet weather; ultimately reducing combined sewer overflows into the Black Creek watercourse. Clam Sham Temple Buddhist garden and temple, WSP: a project to develop the stormwater management design for the Clam Sham Temple to meet challenges while providing an aesthetically pleasing solution. Alert Labs: Alert Labs’ intelligent leak and flood detection devices address water conservation challenges using real-time monitoring. The devices help property owners identify and respond to problems, as well as reduce the amount of water that is wasted in the residential, industrial, and commercial sectors. Climate Atlas of Canada: a made-in-Canada interactive tool for citizens, researchers, businesses, and community and political leaders to learn about climate change in Canada. It combines climate science, mapping, videography, and storytelling to bring the global issue of climate change closer to home. It was designed to inspire local, regional, and national action and solutions. Eddy Home: Eddy’s IoT Intelligent Water Monitoring technology enables leak detection and preventative measures in buildings, resulting in water savings, and an improved water conservation methodology. Our suite of products equips users with the ability to monitor, control, and conserve their water usage, protecting them against the risk of water leaks and damage while simultaneously challenging them to make positive conservation changes. Mackenzie Datastream: providing an open-access, online platform for sharing community-based and government monitoring data to generate information to address water challenges. First piloted in the Mackenzie Basin, DataStream is now expanding to include regional data hubs in Atlantic Canada and the Lake Winnipeg Basin. Water Smart Irrigation Professionals (WSIP) Program: the WSIP Program was created to manage max day water demands directly through the reduction in excess irrigation. The program also encourages market transformation in the irrigation industry to make the water-efficient design, hardware, and controls the new industry standard in Peel Region, Ont. Hydrologic and hydraulic assessment of the Welland River in Niagara Falls, WSP: the study’s purpose was to better understand the extreme flow conditions and the impact of downstream controls on flow, allowing for better response to extreme events and reducing the impacts of flooding. Regional District of Nanaimo: implementation of a program that addresses drinking water and watershed protection through regional coordination of water management initiatives across jurisdictions, employing collaboration with many partners on a watershed/aquifer scale. Water Rangers: an online platform designed to empower citizens to discover existing data, report issues, and record observations of their lakes, streams, rivers, and oceans. It also gives tools to different types of groups so they can mobilize volunteers to make an impact on their watersheds.